Already well on our way with June, we’ll soon be seeing summer’s long hours of sunlight and heat coming to our homes. While most everyone enjoys a little time relaxing in the yard when the weather is nice, we still have to keep in mind what’s going on inside the house. Intense sunlight can cause discomfort and at worst, damage to your home’s interior. Luckily, an awning provides a simple solution for you this summer, courtesy of Carroll Awning Company. Day after day of light exposure can turn your once vibrant and colorful furnishings faded and pale. Even non-fabric furnishings, such as cabinets or hardwood floors, can suffer from too much sun. While it is possible to try to restore the original color, this can prove difficult, especially with fabrics, and expensive. Head off those headaches from the start with an awning, which will provide shade to your home where windows are exposed and keep those couches and bookshelves looking like new. Maryland and Virginia summers, we all know, can get extremely hot and humid. But is it worth keeping your air conditioning running all day when you’re off at work to make sure you don’t have to come home to a house like an oven? When your windows are shaded and protected by an awning, less of that heat gets trapped inside, making for up to a 15 degree difference in your indoor temperature. Save money by skipping the expensive AC and investing in an awning that will keep you cool all summer long. Wood that makes up part of your house’s structure is just as susceptible to sun damage as anything else. If constant sun exposure is an issue, this can cause your home’s structure to weaken and put it at greater risk for other kinds of severe weather threats. An awning shields your home from this kind of danger, ensuring it will be long lasting and comfortable for your family for years to come. 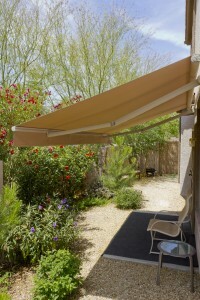 Want to get your awning before the sun gets to you? Visit the Carroll Awning Company homepage at carrollawning.com or call us at 1-800-999-5617 for more details.